A little break: happy new year! 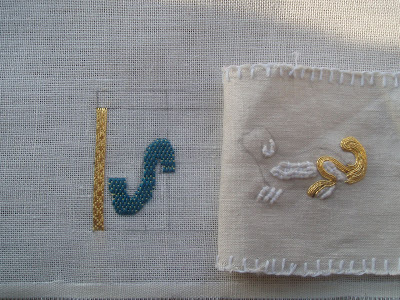 This year, I've tried to recreate two 14th century goldwork embroidery purses that I really love : the Tongeren purse 23 and the Herman von Goch golden purse with the little dog (so cute!!) I used Japanese Gold K4, 0.5 mm and it doesn't really work: its too thick/ coarse. 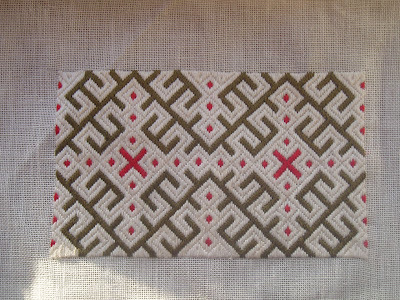 I've decided to stop working on those purses for now, until I find gold thread that is more suitable. In a comment to a post on the Tongeren purse, Gina advised me to take a look at Benton & Johnson for gold thread that is thinner. If a find something more suitable, I'll tell you. For now, I'll show some pictures of what my first attempts look like and what needs to be changed. 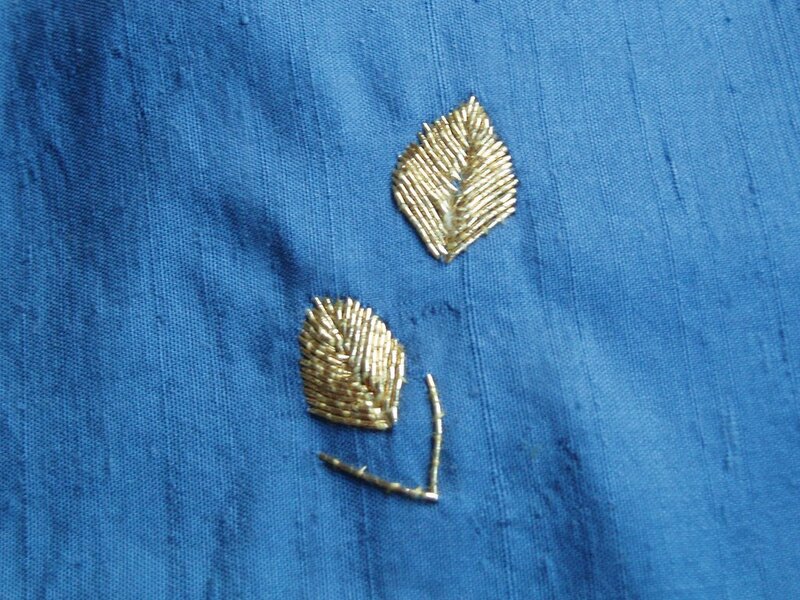 These are the leafs of the Tongeren purse: the front look ok, but there's too much gold thread left at the back. The leafs are very small (about 2 cm). 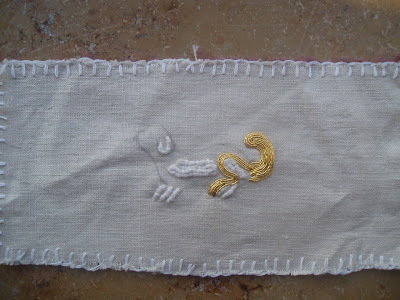 I'm not sure whether the gold thread was couched and turned at the surface, or whether each thread was couched individually, without turning (which is the technique I used in the picture below). 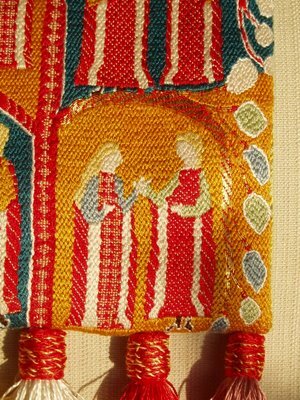 I'm interested in literature as a source of information about embroidery and I would really like to find out more on embroidered garments: was embroidery used for decorating cloths and, if so, when, who, how, where etc? It's a very nice book, with a lot of interesting historical details. I was surprised by a picture of two beautiful 16th century white linen shirts, embroidered in black and white silk ("Blackwork"). This reminded me of some lines in The Canterbury Tales (around 1380), which I read last summer. What I really like about Chaucer, besides the fact that most of his stories are very funny, is the way he describes his characters. I don't think he was familiar with the poetical device called ut pictura poesis, a picture in poetry, but the descriptions of his characters are very vivid, clear and detailed. It appears as though he shows you, the reader, some polaroids of the actors, before he starts telling their story. Upon hir lendes, ful of many a goore. According to the notes (Oxford, Riverside Edition 1987, p. 68) a barmcloth is an apron and a smok is the undergarment/shirt worn beneath the apron. Broyden means "embroidered" . That's interesting!!!! Does this mean women could wear embroidered shirts? If so, what would those have looked like? Tasseled with silk and perled with latoun. I love to read things like this and I think literature can be a valuable source about medieval life etc, next to archeological findings and the like. There's a lot more to say about the description of the miller's wife, so this post is to be continued...! 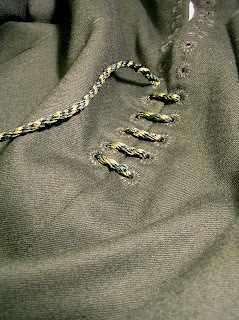 Last saturday I've been working on a long fingerloopbraid to use as a lace for my green dress. I have been using a cotton lace until now, and thought it really was about getting time to make something decent to fit the dress. I used 1440 denier silk loose twist from DeVere Yarns. It is the first time I used filamant silk for making braids. I don't really feel a difference in use with spun silk. But, the result with filamant silk looks so much better, prettier, shinier!!! The lace is still waiting to be finished with two brass points. Recently I made a small experiment comparing Devere 1200 denier and Au ver a soie Soie d'Alger. My experiences are that both are very pleasant to work with for embroidery. Devere yarn is more glossy and slippery than Au ver a soie and it's also more "fragile": be careful with your nails! Au ver a soie silk is less glossy and has got more texture. You can compare the two below: left is Devere yarn 1200 dernier silk and right is Au ver a soie silk. 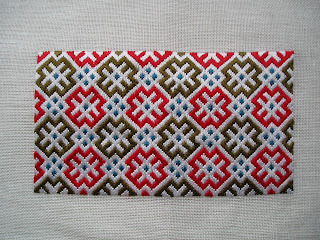 My swiss 1320 purse (see post 27 nov 06) is made with Au ver a soie. 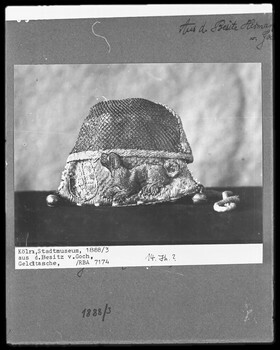 The previous blog entry, written by Machteld, turned out to be quite interesting as to which yarn type she used to make her embroidery. I thought it interesting enough to write a complete post about the subject of silk yarns, and try to share with you everything I know about it... Which yarns to use when? As Machteld wrote in her comment she uses 'Au ver a soie' silk embroidery floss, very similar to DMC cutton floss. I habe been using another kind of spun silk yarn, of which I do not know the brand. 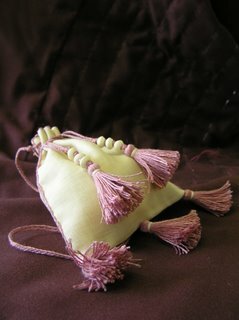 I have found spun silk to be ideal for making tassels, but less perfect for the embroidery itself. found to historic silk. 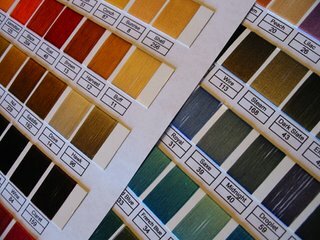 It is filament silk, with so much more sheen that spun silk. They also do some lovely cottons and linens, and worsted threads, and I can't recommend them enough." 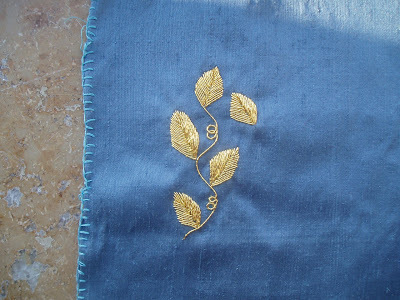 I must admit I have never used DeVere silk for embroidery before. I have just recieved my first order, but the yarn I ordered I will be using for fingerloopbraids. When I have some left, I'll sure use it for embroidery, and off course let you know the advantages and disadvantages compared to spun silk. Also, an interesting discussion about this subject can be found on the Soper Lane forum. You can read it here. There are some members of Sopor Lane who are far mor knowledgeble on this subject than me, and have seen far more original pieces! 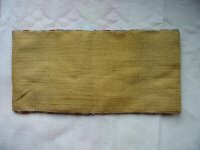 In the discussion, it seems to turn out that medieval silkwomen used to prefer to work with filament silk, and that for fingerloopbraiding, tabletweaving and embroidery, filimant silk was probably used in most cases. Spun silk could have been used for making tassels, or silkwork of lesser quality. 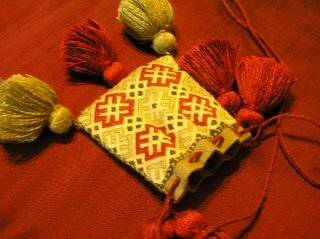 I'm going to make some small embroidered purses for Nijso to sell at medieval fairs next spring/summer. 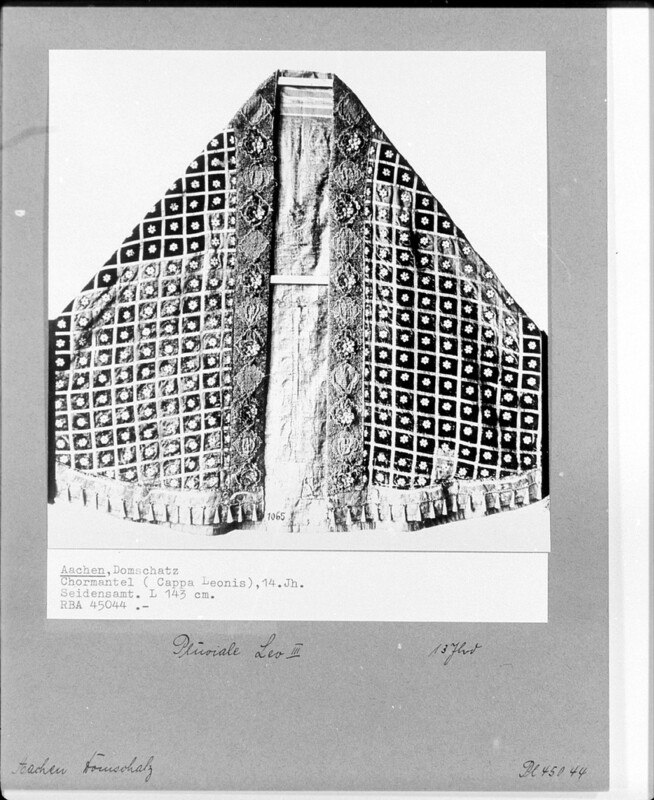 This is the embroidery of the first one. 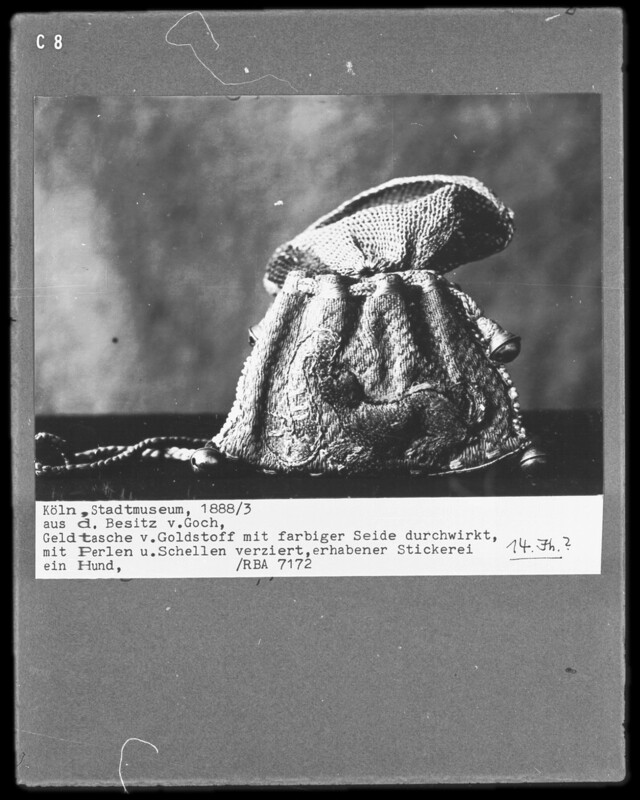 It probably looks familiar: Isis and I already made this purse. I still like its pattern, especially the blue dots. 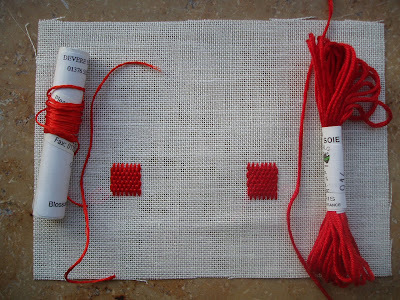 There are more counted thread embroidery charts at Wymarcs page, and I think I'm going to try some of those next. When I went to see the Dommuseum in Aachen last spring, I did not expect to find a 14th century coronation mantle there. Some additions date to the 15th and 16th centuries, but the white flowers all over the mantle are believed to be late 14th century. These flowers are particluarly interesting. The petals are made with white silk, and the heart is yellow. The colours may have been faded. 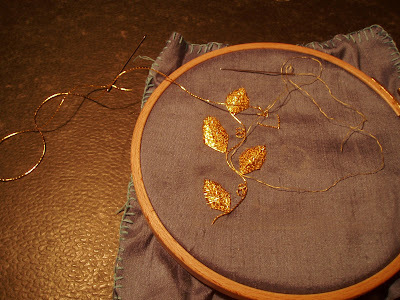 The flowers are embroidered using the French Knot stitch. 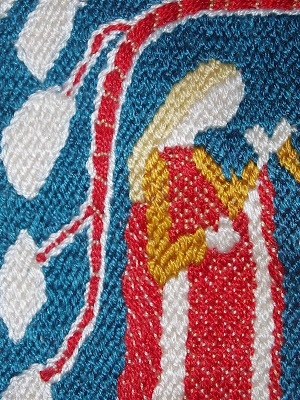 I don't believe I've seen this stitch used on 14th century embroideries anywhere else before. I couln't find an online picture, so I'll try to describe it here. The bag is embroidered with a picture of two lovers under a tree with flowers. 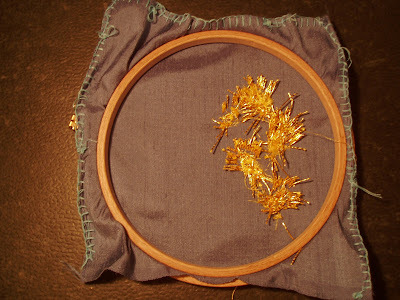 The background is covered in silver gilt thread, which is unusual. 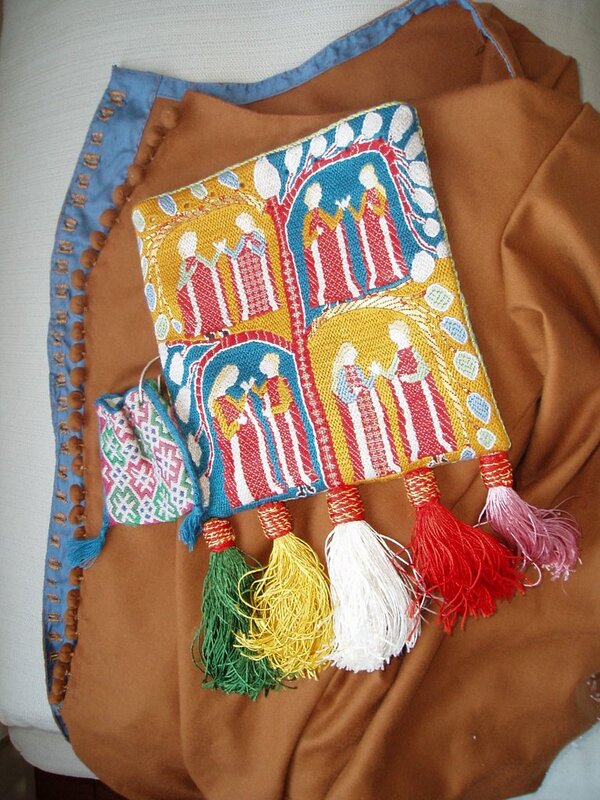 The picture is framed by an embroidered band with flowers and fairy tale creatures, a bit like purse LM 1825 b. 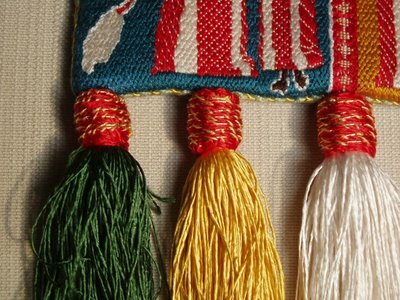 The tassels are also the same style as those in the Landesmuseum. 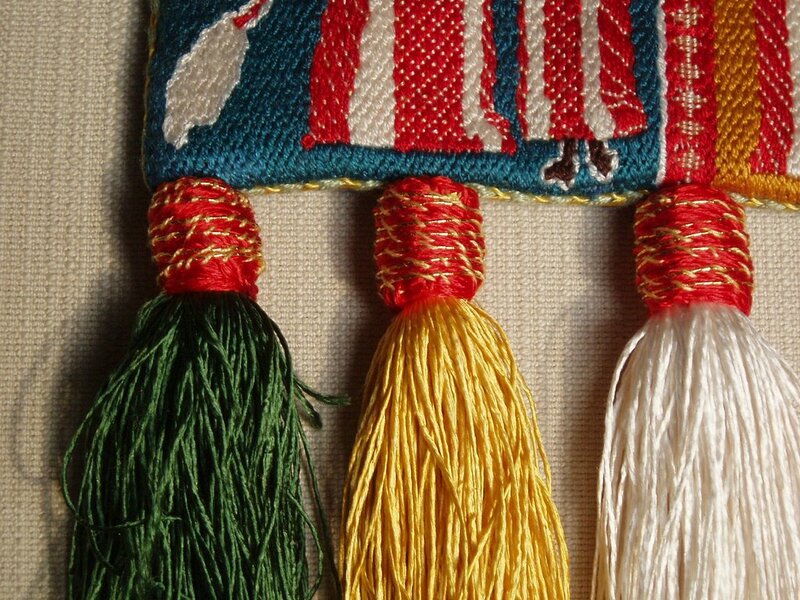 Isis discussed the technical details of some tassels in earlier posts, e.g. 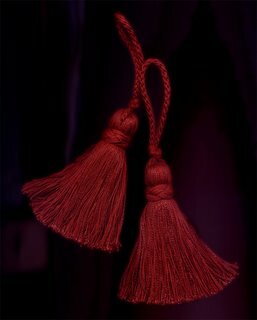 Medieval silkwork: Tassels: second half of the 14th century, Medieval silkwork: Late 15th century tassel. 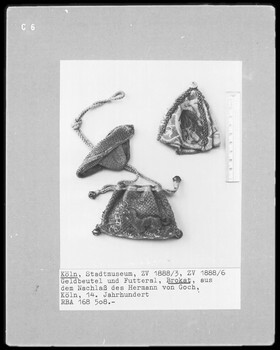 I found two Swiss circa 1320 purses with tassels that are made using yet another technique. 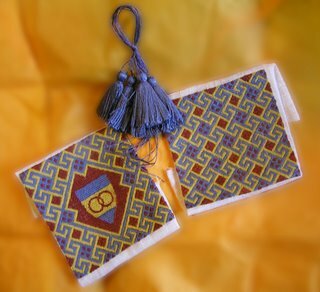 I examined both purses and it seems that the tassels were made by wrapping a silk thread around the head and fastening it with gold thread. 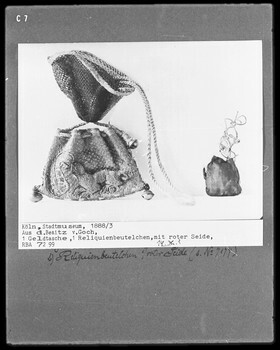 Pictures of the purses can be found in the Webcollection of the Landesmuseum in Zurich. 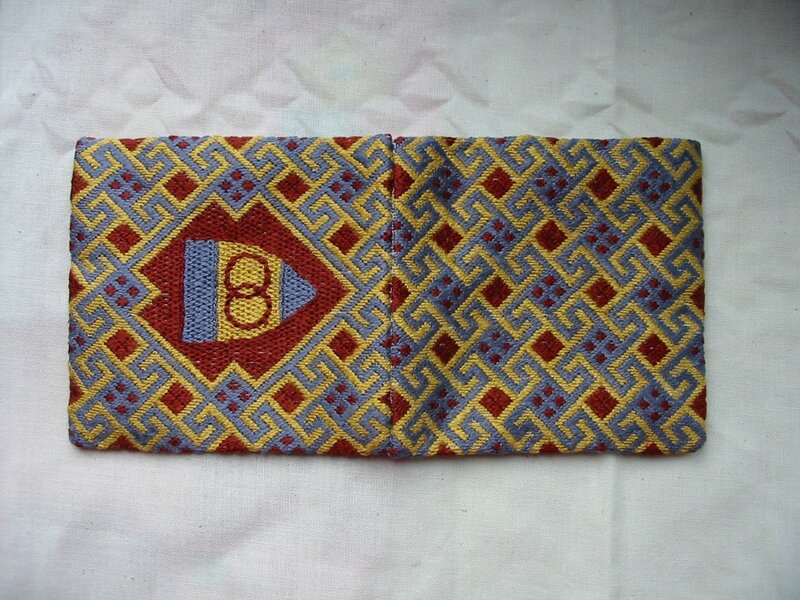 Search for 'beutel' or LM 1825 a and LM 1825 b.
I really like one of the purses described in the book Tongeren, textiel..., Ceulemans 1988. Purse 23 is a small purse (8*10 cm) made of blue silk with embroidered golden leafs, dated roughly 13th-14th century. 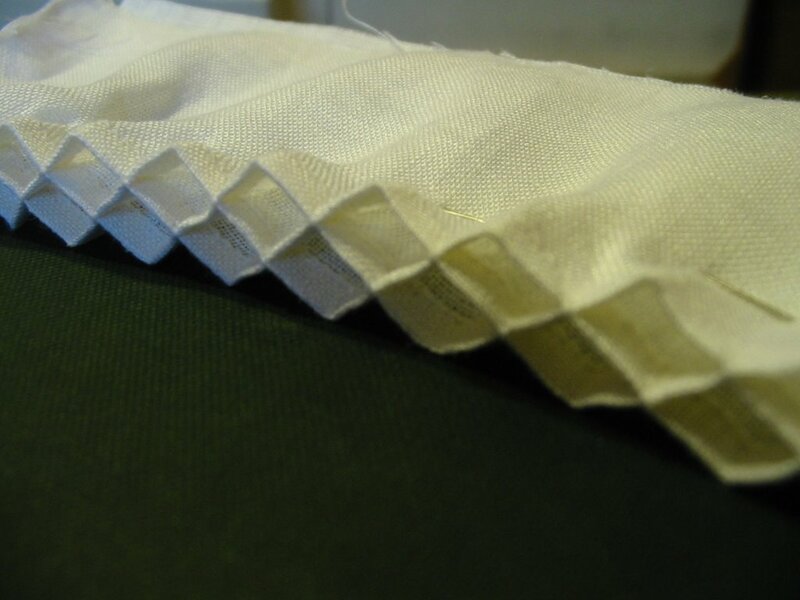 The technique used is called 'couched work'. 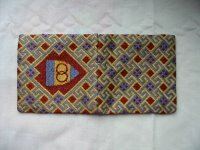 You can find a description of it on the Historical Needlework Resources website. I might be going to make myself a frilled veil with three layers soon. I would so like to have one! Yesterday I've been working on my article about late 14th century kruseler, and a possible construction method. The theoretical part of the article is almost finished, but I still need to write the part about my own experiments. I haven' tcompleted all experiments, so I'll need to do that first. In the meanwhile, it's fun to read what other researchers involved in the Kruseler-project are doing: click here to see. I'm not being a good student today. I should be in class at the moment. But. I really didn't sleep well tonight and also went to bed way to late. And I got up with a soft headache, that started getting worse around twelve o' clock. And I had lots to do before I had to go to college, so I was completely stressed out. I'm trying to make it up by working for university at home, which means reading articles and more articles. And in between two articles I take a break and make good use of the opportunity to write something here! I have been wanting to add some text to Saturday's post, but Blogger didn't want to coöperate last weekend. So now, as you can see, there are only pics. I'll add some more info here then, allright? 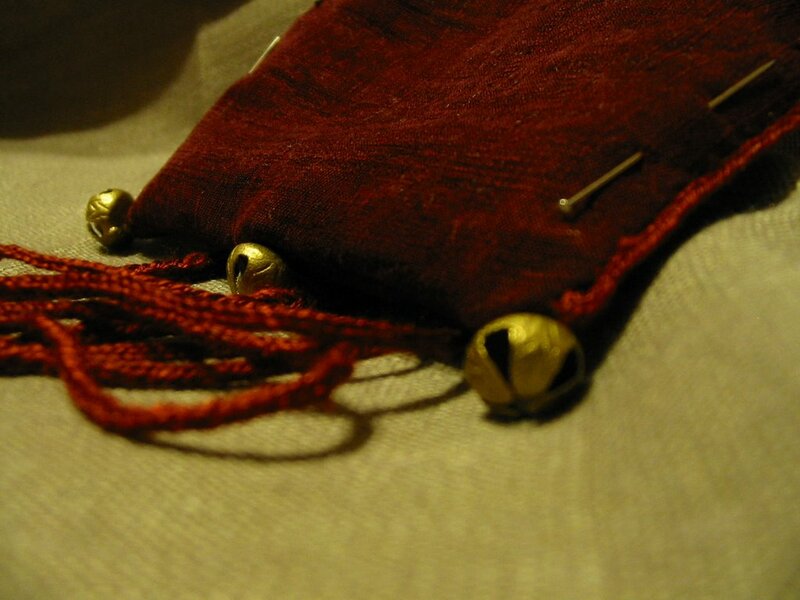 What I wanted to write is something about the lining of this purse, and medieval purses in general. 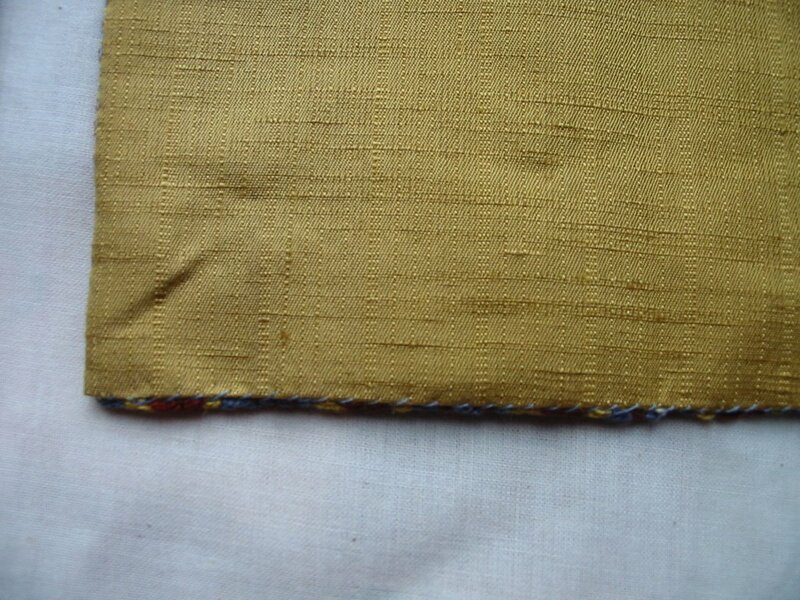 I used a piece of yellow silk and sewed it to the embroidered parts, leaving about one mm uncovered at the sides, to give me enough space to sew the sides together later. I have no idea wether this is the correct way to do it, or at least the way used on medieval purses. I have'n been able to study original purses close enough to see how the lining has been made. 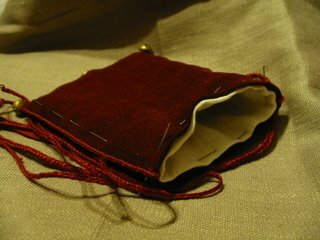 I have also tried a different method: making a seperate little 'bag' with the lining-fabric, and then put this inside the embroidered piece that is sewn together at the sides. So in fact you have two purses, lining and outside, that you sew together at the top. I used this method for this purse. The first method works better for me. But I really wonder how other people do this, and how it was done on the original pieces! This afternoon I finally found the shade cards of DeVere Yarns I've been waiting for so long. Now I can order the silk I need for making the gimp cord for the turk's head knots to cover the heads of the tassels for this purse with. That's all for now, back to Environmental History! 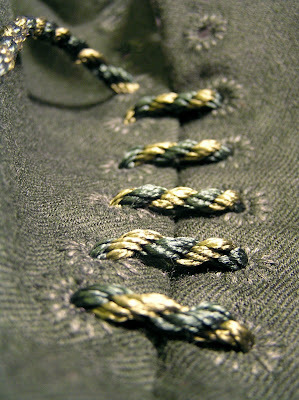 Making a 15th century doublet also implies making laces to lace the doublet up. One lace for the front, and in this case also two laces for the sleeves. 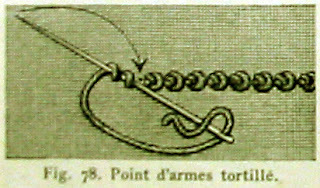 Fingerloopbraiding is a technique based on the exchange of loops held on the fingers. 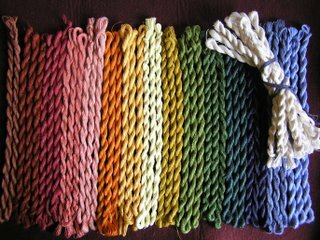 The braids can be made by one person, but there are also variations that need more workers (depending on the lenght of the braid and the amount of loops used). There are some medieval depictions of the practice of fingerloopbraiding. The oldest known depiction dates to the 13th century, and can be seen on a wall-painting in Konstanz, Germany. There also is an Italian fresco (Florence) which shows the Virgin Mary and the little Christ working on a two-looped braid, that is being used to edge a piece of clothing. Although the date for this fresco is not known, it seems late 14th or 15th century to me. More information can be found in this issue of the LM BRIC News. 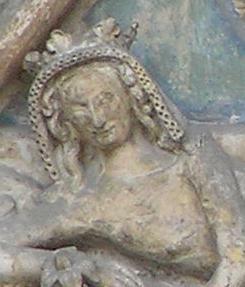 Probably Mary is using this technique, described by Frieda Sorber in "Tongeren Basiliek O-L-Vrouw Geboorte. Textiel. Uitgeverij Peters, Leuven, 1988." Which is quite interesting. So far I only know about this technique being used on purses, but now it seems it can be used on clothing as well. I have suspected this for a long time, but couldn't prove it. 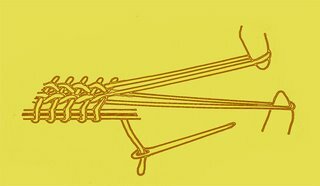 Another very interesting website is this one: Loop-Maniputlation Braiding Research and Information Center. They have information about fingerloop braids from all over the world and from different periods. You can discuss fingerloop braids here. Sorry to all you not understanding Dutch, but the rest of this message will be in Dutch. Maybe I'll translate it sometime later. Er is geen speciale afwerking. De naden zijn gewoon zichtbaar. Voor zover ik weet werden geborduurde beursjes wel steeds afgewerkt. 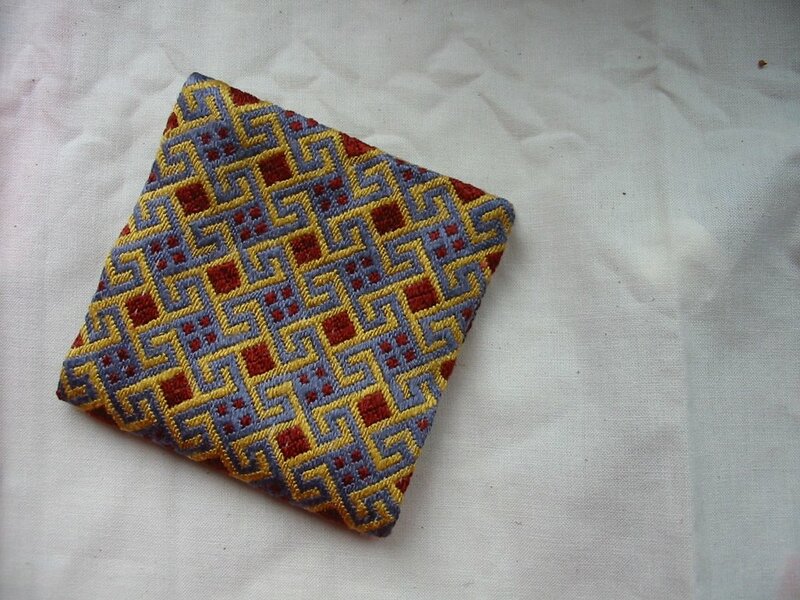 Ik heb zichtbare naden enkel nog gezien op effen zijden tasjes. De zijnaden zijnafgedekt met een opgenaaid fijn stukje bandweefsel. Dit kan effen zijn of een patroontje hebben. Het is gemaakt uit hetzelfde garen voor het borduurwerk zelf, in dezelfde kleuren. De zijnaden zijn afgewerkt met een fijn stukje opgenaaid bandweefsel. Dit kan effen zijn of een patroontje hebben. Het is gemaakt uit hetzelfde garen voor het borduurwerk zelf, in dezelfde kleuren. Een vierde techniek is het lussenvlechten, zoals beschreven door Frieda Sorber in "Tongeren Basiliek O-L-Vrouw Geboorte. Textiel. Uitgeverij Peters, Leuven, 1988." Deze techniek werkt het makkelijkst wanneer gedaan door twee personen. Er werden zowel één als twee kleuren voor gebruikt. De aanwijzingen vind je op de tekening hier onder, een foto van het eindresultaat op de onderste foto. Naar een afbeelding uit "Tongeren Basiliek O-L-Vrouw Geboorte. Textiel. Uitgeverij Peters, Leuven, 1988." you can't cheat by looking at the picture."